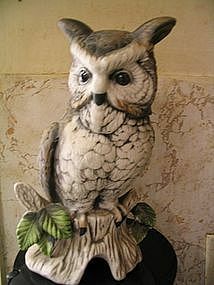 Vintage ceramic owl measuring approximately 10 inches in height. There is no manufacturing information. It has no chips, cracks, breaks and very little if any loss to the finish. I have 2 of these available for purchase. I need your zip code to calculate the postage.